Today, begin your journey to the Sacred Valley, where you spend the next three days immersed in the mystical Inca splendours and traditions that define this high-Andean region. 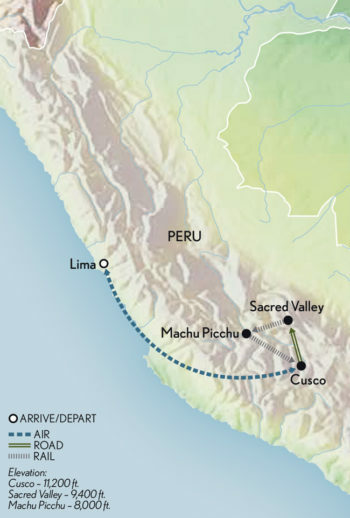 In the morning, fly to the Inca capital of Cusco, gateway to Machu Picchu, and enjoy lunch in the central square. Travel to the Sacred Valley, stopping en route to visit Awana Kancha, where South American camelids (such as llamas and alpacas) are bred, and where you learn about the fibres created from their coats. Continue to your intimate, hacienda-style hotel nestled in the Sacred Valley, and settle into your own luxury casita, boasting private, tranquil surrounds and breathtaking views. Today, travel higher into the Andes to kayak the remote lagoon of Huaypo, a secluded gem set 12,464 feet above sea level. Paddle its pristine waters at your own pace, taking in the stunning mountain-scape. Andean cultures have long revered Mother Earth goddess Pachamama for sustaining life on our planet. This afternoon, participate in one of Peru’s oldest and most sacred rituals when you join a local shaman in a traditional “payment to the earth” ceremony, extending an offering to Pachamama, to give thanks and honour new beginnings. Reflect on the experience during a scenic picnic lunch overlooking the lagoon. Then, enjoy a visit to a remote, richly cultured and seemingly timeless mountain community where you delve into a guided talk on medicinal plants and demonstrations in ancient traditions. Return to your hotel for an evening at leisure, where you may choose to cap off the evening with your included, replenishing spa treatment. Begin today with a meaningful visit to the Kuychi Centre, meeting the underprivileged children at Niños del Arco Iris (Children of the Rainbow), a project supported by A&K Philanthropy. Explore the charming colonial village of Pisac, once the imperial gateway to the Sacred Valley. Discover an archaeological site with a vast array of artefacts and structures. Next, privately visit a farmstead to immerse yourself in local life. Join the owners for a tour of the fields, a farm-to-table lunch and a parade by the farmstead’s paso fino horses. Back at your hotel, watch the sunset give way to a starlit sky (weather permitting). This sets the stage for a captivating talk on the importance of astronomy to the Incas, who believed the moon and the sun were deities, and that every constellation has a purpose. Enjoy the rest of the evening at leisure. Spectacularly positioned on a narrow ridge above Rio Urubamba, the mystical Inca citadel of Machu Picchu with its temples and ritual structures held great spiritual significance for the Incas. Journey to its heart today, beginning with a private lecture by a renowned Machu Picchu scholar. Then, board the PeruRail Sacred Valley train, travelling deeper into the Andes and toward the ceremonial epicentre that is Machu Picchu. Arrive at the only hotel adjacent to the citadel, a respite wrapped in gardens and offering magnificent views. Experience the mysterious site for the first time with a guided afternoon visit. After an optional private morning yoga session, Design Your Day with a range of inspiring options. Browse the picturesque San Blas neighbourhood, a haven for local artisans; enjoy a lecture on the divine coca plant and coca-leaf oracle readings, followed by a private session with a local shaman; or enjoy a restorative spa treatment at your hotel. After lunch, tour Cusco’s Cathedral on the Plaza de Armas and Santo Domingo Temple. Later, explore the well-preserved Sacsayhuaman, another testimony to the Incas and their ability to skilfully blend massive structures with the natural landscape. Tonight, gather for a cocktail reception and farewell dinner at the elegant MAP Café.